Imogen Lovelace is an ordinary fangirl on an impossible mission, save her favorite character, Princess Amara, from being killed off from her favorite franchise, Starfield. The problem is, Jessica Stone, the actress who plays Princess Amara, wants nothing more than to leave the intense scrutiny of the fandom behind. If this year's ExcelsiCon isn't her last, she'll consider her career derailed. When a case of mistaken identity throws lookalikes Imogen and Jess together, they quickly become enemies. But when the script for the Starfield sequel leaks, and all signs point to Jess, she and Imogen must trade places to find the person responsible. That's easier said than done when the girls step into each other's shoes and discover new romantic possibilities, as well as the other side of intense fandom. As these princesses race to find the script leaker, they must rescue themselves from their own expectations, and redefine what it means to live happily ever after. Attending the popular culture event is an institution for Imogen Lovelace, Starfield enthusiast and creator of the online campaign to save Amara, the female heroine of the popular franchise. The online petition amassing thousands of signatures. Attending the convention with her brother Milo and parents Kathy and Minerva, Imogen intends to campaign for the Starfield sequel and intermingle with convention aficionados, including internet friend and artist Harper Hart. Jessica Stone is an award winning actress reprising the role of Amara, the princess of Starfield. Darien Freeman has portrayed the immortalised Prince Carmindor to acclaim and Jessica, a target of internet abusers dissecting her credentials, her appearance and the comparison to the original Princess Amara. Jessica isn't interested in reprising her character in the Starfield sequel, despite the online campaign gathering momentum and in a moment of resentment, Jessica discards her script at the convention as the narrative is disclosed on social media. The alternating narrative accompanies Imogen Lovelace and Jessica Stone, two dissimilar young women colliding through happenstance at the Excelsicon event. Aesthetically, Imogen and Jessica are interchangeable, Jessica is suffocating under the expectations of the Starfield fandom and Imogen is the creator of the Save Amara campaign. Imogen is answering questions on a Starfield character panel at the convention, successfully mistaken for Jessica and uses the opportunity to lend voice to her online campaign. Reluctantly, Jessica allows Imogen to covertly assume her convention appearances, chaperoned by manager Ethan Tanaka as Jessica investigates the saboteur who has obtained her script. Excelsicon is atmospherically exhilarating, in particular the assiduous Artists Alley and African American artist Harper Hart, Starfield merchandise designer. Believing that Jessica is Imogen, Jessica and Harper are developing a gentle friendship and endearment and Imogen in her capacity as Jessica, despite her frustration, is developing an attraction to Ethan, Jessica's confidant and assistant. The Princess and The Fangirl is a celebration of diversity and friendship. Platonic love, attraction, same gender relationships, parental relationships and memorable acquaintances. American Asian, African American, gay and lesbian, vibrant, diverse and inclusive characters. Popular culture enthusiasts can create a wonderfully inclusive environment as experienced at Excelsicon but also discloses the negative and antagonistic factions that engage in online abuse and harassment. Jessica Stone reprised the character of Amara in the successful Starfield franchise. On social media she is taunted, abused and degraded rather than being exposed to the inclusive environment. It also touches upon creators and unpaid labour, the acknowledgement of the prejudice against black women in film, sexual assault and also challenging the inequality of female actors within the industry as Jessica is harassed and Darien Freeman, celebrated. The Princess and the Fangirl is categorically enchanting. A whirlwind of effervescent and charismatic characters, diversity and inclusiveness, challenging stereotypes and societal adversity. A gentle romance and tender friendship, creating one of the loveliest contemporaries you're likely to discover this year. Absolutely, positively recommended wholeheartedly. Love, Love, Love! Awesome review Kelly. I am super keen to read this lovely. Yes Sarah! They're both such feel great reads with wonderful social messages throughout. Brilliantly diverse and both reads really emphasise the importance of inclusion and acceptance. I can't wait to see what you think of it! SQUEEE! I don't think you understand how much I adored Geekerella and to see such a fantastic review for the companion is a wonderful thing. I am really happy to see the second book seems to deliver the same sort of feels. It's the companion novel we all deserve to be honest. Funny, feel great and inclusive. No doubt it'll be one of the best contemporaries you're likely to read this year. Aw I'm glad you liked this one! It was such a love-letter to the geekdom life. SO SWEET 😍And the romances were super cute too !! I think I did end up liking Geekerella a bit more? But I still love how she's doing like geek/nerd conventions but also fairy tale retellings! I think the romance format in Geekerella was really lovely, I loved the messages between Elle and Darien. I felt a little more invested in the relationship between Jessica and Harper but only slightly. I can't wait to see what she's working on next! Yay, I'm so happy to see your 5 star rating for this book! I adored Geekerella and have been anxiously awaiting the first reviews for this new book. Now I'm more excited than ever to read it. Geekerella was so universally loved wasn't it, I absolutely loved it. This one takes everything we loved about Geekerella and made it more inclusive. I love these books, such wonderfully feel great reads. Looking forward to seeing what you think of it Suzanne! Oof, this sounds like a mess when it happens in person but an absolute delight to read about with a cute romance in a convention setting. I've yet to Geekerella, though. 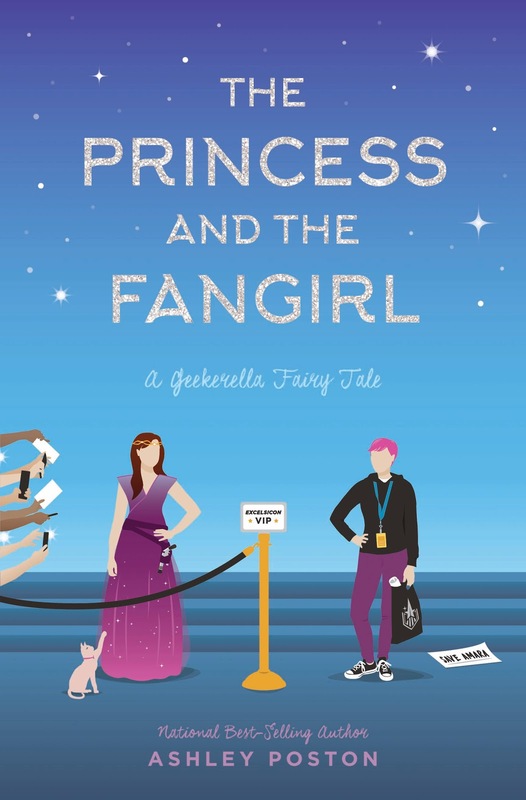 You don't really need to have read Geekerella to enjoy The Princess and the Fangirl but there's a few cameo appearances in there. I'd recommend reading Geekerella though just because it's so delightfully wonderful. I do love books that focus on popular culture, and this sounds like it was done really well. It's horrible how mean people can be online, so it's nice that there is a YA book that kind of focuses on that. It's important to show those negative aspects too. Placing characters in realistic online situations could also help readers combat online abuse themselves. Such a wonderful read with a strong social conscious and messages of inclusion. I love books like this, LOVE. There's so much goodness in fandom, but I think the good gets weighed down in how conventional it appears to people who don't understand how inclusive and welcoming fandom can be. That said, there's a heap of bad too that needs to be addressed. Still this book just makes me want to draw hearts around it! Same Verushka, same! It's so incredibly atmospheric too, the convention floor, the character panels and the celebration of the popular culture movement. I can't wait to see what you think of this one Verushka! I still haven't read Geekerella yet, but I've heard lots of good things, and this sounds like a fun and timely read! It's just wonderful Isabelle. The author does a superb job at inclusion and representation and even if you're not involved with popular culture conventions or fandoms, like myself, you'll still absolutely adore these books. Thank you so much! It's one of those series that has something for everyone! The romance, the friendship, the strong female characters, the inclusion and representation. Characters of colour, gay characters, lesbian characters, characters that identity as bisexual. People from all walks of life that are celebrating the fandom. It's incredible. I also have not read the Geekerella series but this review makes me want to dive in. I love your summary! And now I'm positively curious! Hey Rebecca, how have you been? You don't need to read the books in order but you'll most definitely want to. It's not often you come across such entertaining and inclusive feel great reads but this series is utterly brilliant! Oh! I didn't realize this was coming soon. I loved the first book. It was so sweet. Wasn't it just Karen! You'll still need to wait a few months until release but the perfect time to preorder once you move into the new house! I really liked the first book so I was excited to hear there would be more to come with this book. It does sound really good and I think I need a Geekerella reread and then to jump right on into this because it seems pretty good.